Google has just launched its 2016 smartphones. The Nexus moniker has gone and the new models are Pixel-branded, just like the company’s top-end Chromebooks and tablet. The Pixel and Pixel XL are made by HTC, though only the Google logo appears on the device, and pretty much only differ in terms of screen size and resolution as well battery capacity. The smaller Pixel sports a 5″ 1080p AMOLED display and a 2,770mAh battery, while the XL variant comes with a 5.5″ QHD-screen and a 3,450mAh battery. In the camera department the specifications have not changed much from last year’s Nexus devices. A 1/2.3″ 12MP sensor with 1.55µm pixel size is paired with an F2.0 aperture. There is no optical image stabilization but Google has added a new gyroscope-based video stabilization system that reads gyro data 200 times a second for smoother panning and shake-free handheld recording. The camera can record 4K video, and in stills mode Google’s excellent HDR+ mode is on by default, using an image stacking approach to reduce noise and capture better detail. In addition Pixel owners can store unlimited full-size images in Google’s cloud service. Check out the photography-specific features of the Google Pixel from the announcement. Both phones come with Google’s brand new Android 7.0 Nougat operating system and are powered by Qualcomm’s latest top-end chipset Snapdragon 821. 4GB of RAM can be combined with either 32 or 128 GB of local storage and a fingerprint reader on the back provides extra security. The Pixel phones will be available in Quite Black, Very Silver, and Really Blue color options. 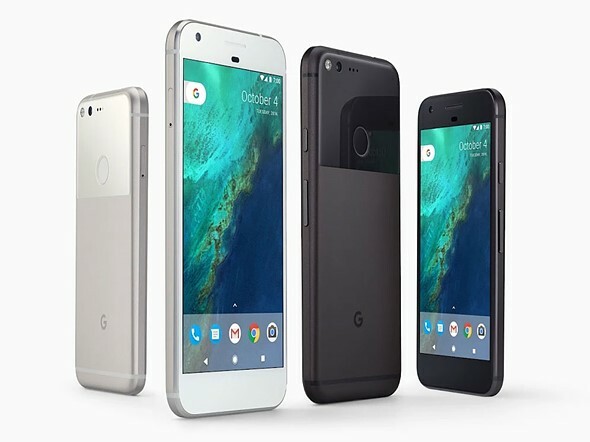 Pricing starts at $649 for the standard Pixel. In the US the devices will be exclusive to carrier Verizon, with pre-orders starting today.